Crushpad is leaving San Francisco. The new Crushpad will be located in Oak Knoll's Silverado Trail Wine Studio within a winery owned by Premier Pacific Vineyards, and is hoped to be up and running by the end of March. Other amenities: it will be open daily, it will add classes on viticulture, there will be a tasting room, and for those winemakers who want to extend their brands, there will be room for larger ferments. 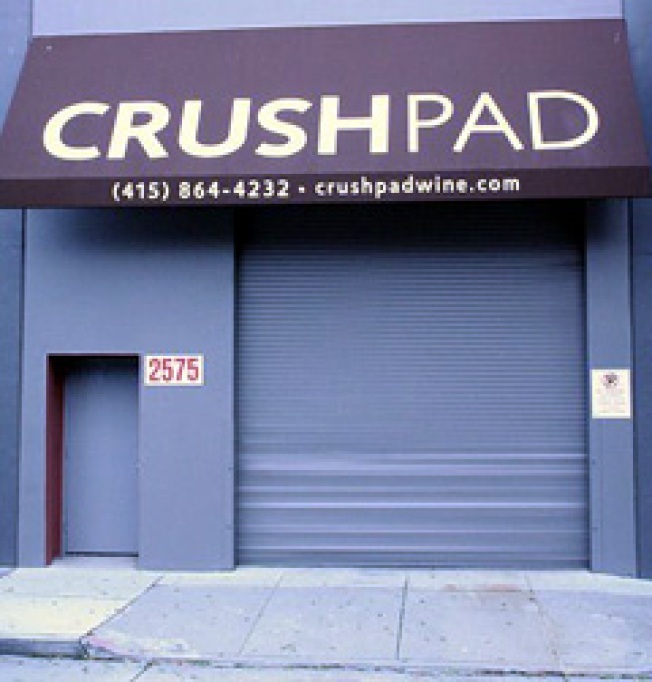 As for the Dogpatch location, Crushpad should be completely moved out by the end of the month. I am pleased to be the first to tell you about an incredible opportunity for Crushpad and our community. After six years operating in the city, Crushpad is moving from its San Francisco warehouse into a true winery on Napa’s Silverado Trail. We are moving into a winery in the Oak Knoll district called Silverado Trail Wine Studio. The winery is owned by Premier Pacific Vineyards (PPV), a high-profile vineyard development company that also happens to be our largest supplier of grapes. This is a great partnership for both companies and for our clients as I explain below. The winery itself was built around 1980 and is surrounded by a 25 acre vineyard. Nobody will mistake the winery for Opus One, but it’s nice, large enough for our needs and provides a great forum to do what we do. Whether it’s fallout from the economy or just dumb luck, we’re getting a presence on a major thoroughfare in Napa without the $10-$20 million it normally costs. Throughout February, we’ll be doing some minor upgrades such as paint, landscaping and, of course, a new Crushpad sign. We should be up and running the first week in March. In many respects, this move doesn’t change that many things for all of us. You still work with the same Crushpad team, make every decision and can participate as much or as little as you like. OK, so you’re surrounded by rows of vines instead of a humming PG&E electrical substation, but otherwise it’s quite similar. So what are the benefits of moving? This is the primary motivation for the move. While we have worked hard to provide as much access to the winemaking process as possible, our efforts to provide experiences outside of the winery have been limited. So many of you have expressed interest in getting more involved in areas such as the vineyard. Not only are we going to add classes on viticulture (we’re surrounded by a vineyard), we are also arranging sessions with well-known winemakers, grape growers and other folks in the business such as our barrel and cork producers. On a side note, Crushpad Napa will be open 7 days a week. At the winery, we will be operating a tasting room where we will be pouring and selling wines made by Crushpad clients. For our commercial clients, this has been a dream for a very long time. Now that will see their wine sold in a high-profile tasting room on Silverado Trail. We will invest significantly to create a destination tasting room where wine enthusiasts can taste dozens of different wines made by small, passionate producers in quantities as little as 25 cases. This is in response to the needs of our larger Crushpad Commerce clients who want to scale up their production while keeping their costs under control. Although the majority of our winemaking will still be exactly as it is in San Francisco - one barrel at a time – we now can help folks who want to grow their brands substantially. Something like 5.5 million wine enthusiasts visit Napa Valley every year. Our goal is to make them aware that the place to make your own wine in Napa is Crushpad. This will help us make more wine, pour more in the tasting room, host more blending sessions and otherwise keep our business humming. For a number of you, this move puts more distance between you and Crushpad. I do recognize there’s something quite nice about stopping in to check on your barrel before you head out to dinner. On a personal level, my four block walk to work is now an hour drive and most Crushpad employees will have a similar commute. Some of you who visit more frequently just don’t have the interest or the time to make the trip to Napa. For you, we will work to minimize the impact by bringing barrel samples back to San Francisco upon request and we will still be shipping out of our San Francisco warehouse. We will also be operating a small office in San Francisco for some non-client facing employees who won’t be immediately moving to Napa. We have thought long and hard about this move and feel that it results in an improvement for the vast majority our clients and, like many once-in-a-lifetime opportunities, we had to jump on it now, before we get into the thick of our 2010 harvest year. Throughout February, we are moving barrels and equipment to Crushpad Napa. We plan to vacate our 3rd Street location by the end of the month or early March. All of the current phone numbers and email addresses will continue to work. We will continue bottling in San Francisco for much of February and then we’ll be bottling out of Napa starting in March. The last week of February leading up to the Mashup (which will still be in San Francisco) will be a tough week for winemaker communications, so please have a bit of patience. We will start our 2010 vineyard allocations on February 26th. We’re excited – and a bit nervous as well. This is a big change of venue for all of us. However, we’re convinced that this is ultimately a great move. Note that the next several days will be a bit nutty, so my response time may lag, but I’m very interested in your thoughts.